sailboat. 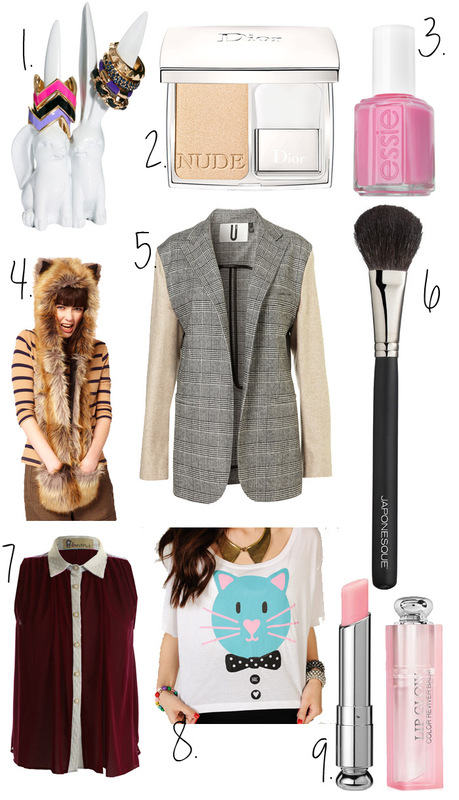 : Mid Week Wishlist! Hey Jennie! Do you ever buy any of the things of your wishlist? My fave thing up there is #7. Aw that ring holder is the cutest thing ever! The Dior lip glow sounds amazing too, I really want to try it! I love the spirithoods, I think they're such a sweet idea, the way it represents different animals :) Liking the Lovestruck shirt too, I always love your wishlists, and it jut makes mine even bigger after looking! ooo love the cat t-shirt it's so cute! That fur hat is awesome, I can so see myself wearing that on cold winters days and I love the blazer! Great post and the bunny ring holder is super cute, i've got this one http://www.urbanoutfitters.co.uk/bunny-ring-holder/invt/5559420266003/&bklist= from urban outfitters and it is super cute and made from metal, there is also a dish with a rabbit in the middle for rings that is really pretty. P.S. Urban outfitters has free delivery at the mo! I really love the look of that lipbalm, I too am a lipbalm-lover - I have WAY too many! I've been using a sample of Dior's serum and moisturiser and have fallen head over heals in love with it. You are right, there is just something lux about their beauty products. Shame that they cost us an arm and a leg! Great choices, I especially like the cat shirt it's very cute! I want a spirit hood too! Ahhh, the lust list! I need number 6 & 9! The bunny ring holders are just too cute!